Sitting a comfortable distance away from the hustle and bustle of Kuta and Seminyak, Uluwatu is your glimpse into the true beauty of Bali: spanning vistas, incredible landscapes and crystal clear oceans. While once upon a time the Bukit Peninsula was mostly about cheap and cheerful warung eats for the surfers, the cafe and cocktail scene has been blowing up for the last few years. From yoga mornings to afternoon coffees or a casual surf to a sunset cocktail, there’s so much to do in Uluwatu that one weekend almost won’t be enough. So before you pack up your Turkish towel, bikini and Hydralite ready for a tropical holiday, here are the very best things to do in Uluwatu. Everyone knows that as soon as you arrive in Uluwatu, the first thing you feel like is a fresh and healthy breakfast, complete with impressive fruit arrangements and a coconut. There’s no better place to get your weekend in Uluwatu started than at Bukit Cafe, where you can wake up to beautiful açai and smoothie bowls, chia puddings and other fresh ’n’ fruity creations. One of the Bukit’s most glorious beaches, Padang Padang beach is the perfect place to spend the morning sunning yourself. Surrounded by lush tropical forest and rugged cliffs, you will not want to leave this place. If you’re feeling adventurous, you can also make the trek down to Thomas Beach or Bingin Beach—they’re usually a bit more spacious, but take a bit of getting to! 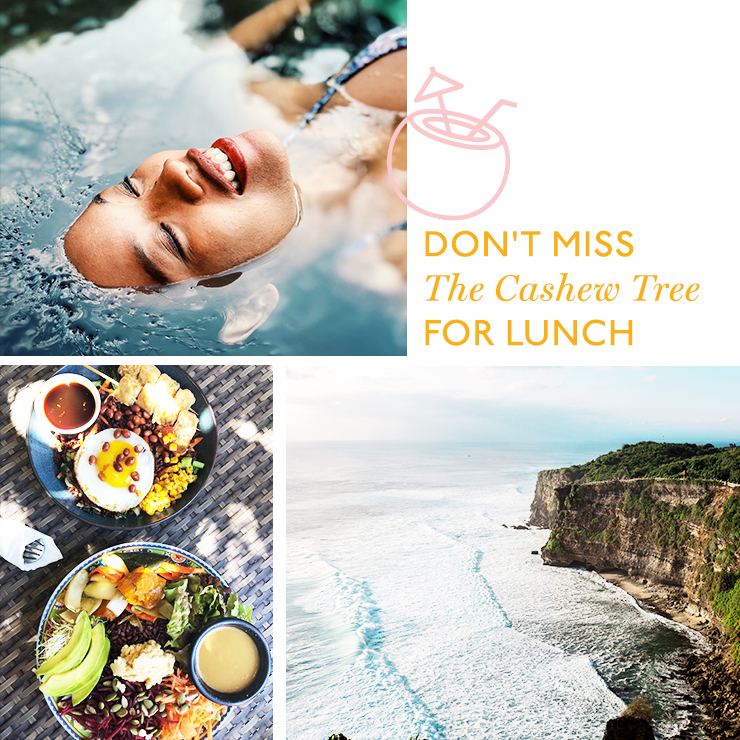 For a healthy and filling lunch, head to The Cashew Tree, right on the top of the cliff above Bingin. Do yourself a favour and feast on the burrito bowl, or if you’re feeling something a bit heavier on the vegetables, one of their incredible organic quinoa salad bowls might be for you! If you’re looking to not leave the beach, check out Kelly’s Warung down on Bingin Beach for delicious lunch-time wraps. While the massage and beauty treatment scene in Uluwatu certainly isn’t as prolific as it is north of the airport, there are still some great spas up in the hills of the Bukit so you needn’t miss out! While you should expect to pay a bit more here than in the street spas of Kuta and Legian, you might find that the old adage ‘you get what you pay for’ rings quite true here. Try Esthetic Day Spa for a good middle-ground price (and damn good massage) or, if you really want to splurge, head to the Anantara Resort Spa and let the world melt away as you’re pampered into a whole new person. Alternatively, you might opt to do something touristy and check out the magnificent Pura Luhur Uluwatu, one of Bali’s most important temples that sits right at the southern tip of the Bukit Peninsula. While it’s generally packed with people after 4pm, it is a pretty special place and offers some of the best views of this rugged cliffside going around. Get your last afternoon dip in and enjoy a freakishly good cocktail or three at the Uluwatu Cliffhouse, a definitively elegant, new(ish) beach club atop the cliffs above Padang Padang beach. With direct beach access, a 25metre infinity pool, concept store, art space and open air restaurant/bar, this place is absolutely prime. Sneak down to their best kept secret, The Ocean Deck, which is propped up half way down the cliff face accessible via a winding staircase only. Sip on more cocktails down there while enjoying what is undeniably the best sunset vantage point on the peninsula! Now that the sun has gone down and you’re sufficiently full of cocktails (jokes, when are we ever? ), you might want to make your way out for dinner. There’s something for all price ranges in Uluwatu - so it’s up to you if you want to eat on a shoestring or splash some cash on a fancy dinner. Either way, your tastebuds will be happy. For the former, head to somewhere like La Baracca for rustic Italian fare, or a local warung for your Indonesian fix. For the latter, look no further than The Warung for Indonesian food with modern flare. Brekky and brunch fanatics, you absolutely cannot miss Suka Espresso. Offering up all the western breakfast fare you can ask for, this place does the Bukit’s best avo smash and absolutely ripper coffee. The vibe is undeniably relaxed so you can chill here for hours, pouring over your coffee or juice and chatting with other holidayers about where the swell’s at today. If you’re a surfer, you’ve probably already kicked this list and paddled out about 18 hours ago. But for the non-surfers, don’t miss setting up shop and watching the locals and travellers alike catch some of the world’s best waves. Our recommendation? Throw down your sarong at Uluwatu Beach, grab a coconut and lather on the SPF 2+. If you’re keen to give it a crack, the reef breaks in Uluwatu probably aren’t the best place—but venture down to Jimbaran’s Balangan Beach and take your pick from the plethora of surf schools offering up board hire and lessons. All that surf-watching will have worked up a hunger, so it’s time to head up the cliff and satisfy. For a tasty lunch that’ll put you in good stead for the rest of the arvo, take a short walk up to Coco & Poke, a simple lunch spot housed within the famous Single Fin, offering up amazing sweet and savoury poke bowls and coconut whips. This place is guilt free snacking galore! 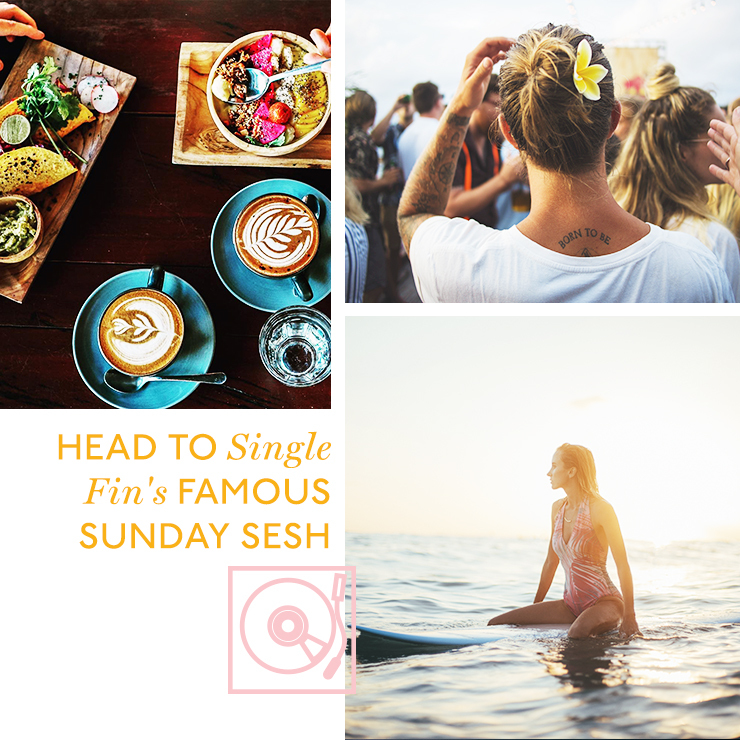 As you hit the pinnacle of your time in Uluwatu, you absolutely must head to the famed Single Fin Sunday sesh! This place needs little introduction, sitting in the heart of the Uluwatu cliffs with downright spectacular ocean views. Settle in with a cold beer or a fruity cocktail or two as the waves roll in and crash beneath you. With live bands and DJs and the buzz of happy travellers in the air, this really is a classic way to see the sun go down on your 48 hours in Uluwatu. If the vibes are running too hot for you at Single Fin, there’s no shortage of other amazing places to spend the rest of your day in Uluwatu. One such fav is Oneeighty at The Edge, featuring what is possibly Bali’s most insane infinity pool. Beware: swimming here is not for the faint-hearted. You can literally see waves crashing onto the rocks through the floor. But it’s certainly a damn fine place to enjoy a sunset like an A-lister, and the perfect way to wrap up your lavish weekend in Uluwatu. Need more to do while you're in Bali? Click here.